The Indian Space Research Organisation launched a PSLV rocket Thursday, carrying thirty-one payloads including the HySIS imaging spacecraft and thirty small satellites for organizations in eight different countries. PSLV launched from the Satish Dhawan Space Centre at 09:57 local time (04:27 UTC). Thursday’s launch saw the Polar Satellite Launch Vehicle (PSLV) make its forty-fifth flight. 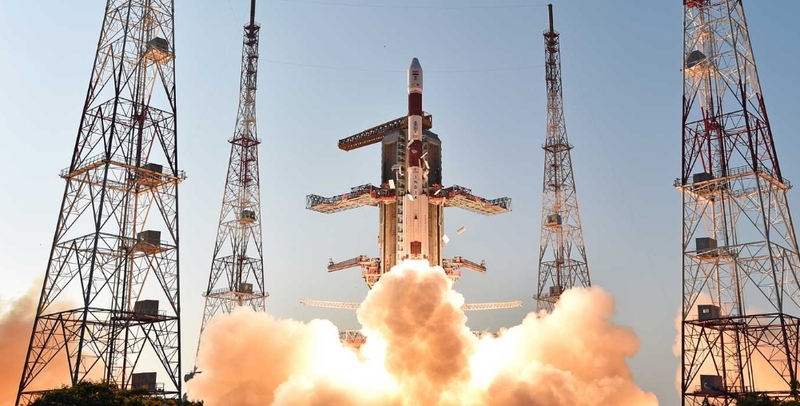 PSLV, the workhorse rocket of the Indian Space Research Organisation (ISRO), was charged with placing an advanced imaging spacecraft into orbit before releasing its multinational consignment of miniature satellites. The Hyperspectral Imaging Satellite (HySIS) was the primary payload aboard Thursday’s launch. 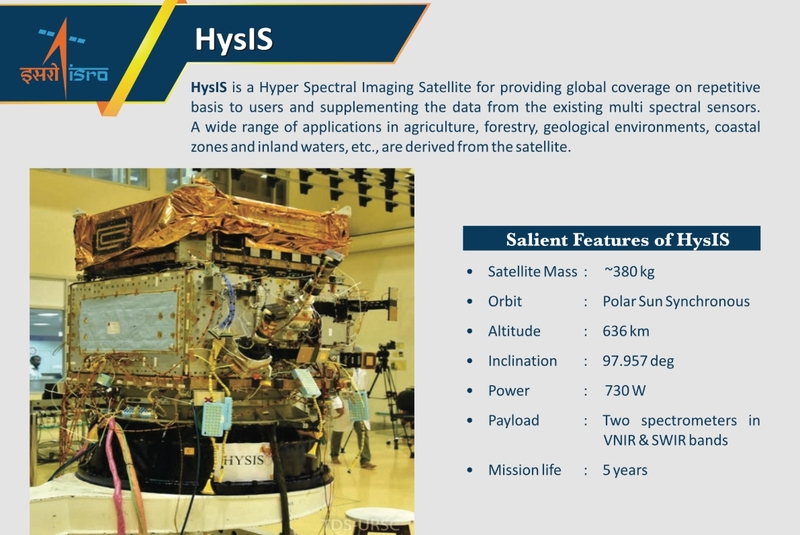 A 380-kilogram (838-pound) spacecraft, HySIS was constructed by ISRO around the Indian Mini Satellite 2 (IMS-2) bus. The satellite is designed to operate for at least five years and will be stationed in a sun-synchronous orbit. Power is generated by two deployable solar arrays, with a total output of 730 watts. HySIS carries a hyperspectral imaging payload, designed to photograph the Earth’s surface across a broad spectrum of wavelengths. This payload consists of two imaging spectrometers: the first operates in the visible and near-infrared parts of the spectrum, while the second will operate in shortwave infrared. HySIS can image the Earth in 55 spectral bands, with a maximum resolution of 30 meters (98 feet) across a 30-kilometer (18.6-mile) swath of the surface. Images returned by the satellite will be used for a multitude of purposes including military surveillance, while ISRO has identified geology and monitoring of agriculture, forestry, water and natural resources as other potential applications. HySIS was joined on its journey to orbit by thirty smaller satellites, which are mounted around two circular plates attached to the rocket below its own payload adaptor. The largest of the secondary payloads was Global 1, the first member of an Earth-imaging constellation being deployed by American company BlackSky Global. Global-1 carries a SpaceView-24 imaging system developed by Exelis which uses a 24-centimeter (9.4-inch) telescope to image the Earth’s surface at resolutions of up to 90 centimeters (35 inches). The 56-kilogram (123 lb) Global-1 satellite was constructed by Spaceflight Services, based around the SCOUT bus, and is designed to operate for at least three years. BlackSky plans to deploy a constellation of up to sixty satellites: the next, Global-2, will be deployed by a Falcon 9 rocket next week. The remaining twenty-nine satellites aboard the PSLV all adhered to the CubeSat standard, a set of common form factors frequently used for small satellites. CubeSats have cuboid shapes measured in “units”, with each unit a cube with sides of ten centimeters (3.9 inches). By adhering to these form factors, satellites can be accommodated with standardized deployment mechanisms and find launch opportunities more easily and cheaply than payloads that require custom arrangements. Twenty-two of the CubeSats will be operated by US companies. Flock-3r, a payload being carried for Planet Labs, consists of sixteen three-unit CubeSats. Planet has already deployed hundreds of these spacecraft, known as Doves, to conduct near-real-time imaging of the Earth’s surface worldwide. Four Lemur-2 satellites, to be operated by another US company, Spire Global, also adhere to the three-unit specification. Each Lemur carries two payloads: SENSE collects and relays Automatic Identification System (AIS) signals from ships on the world’s oceans, while STRATOS conducts weather monitoring via a technique called radio occultation or GPS occultation. Radio occultation, which studies how signals from navigation satellites passing behind the Earth are refracted as they travel through the planet’s atmosphere, allows a satellite to infer atmospheric conditions such as temperature, pressure, humidity and electron density. The Community Initiative for Cellular Earth Remove Observation 8 (CICERO-8) satellite, which will be operated by GeoOptics, also carries a radio occultation payload that will use signals from both GPS and European Galileo satellites. A six-unit CubeSat, CICERO-8 is the seventh member of a multi-satellite constellation to be launched – although three of its predecessors were damaged during launch and failed to operate after deployment. Harris Corporation’s HSAT-1 satellite is another six-unit, or 6U, CubeSat. 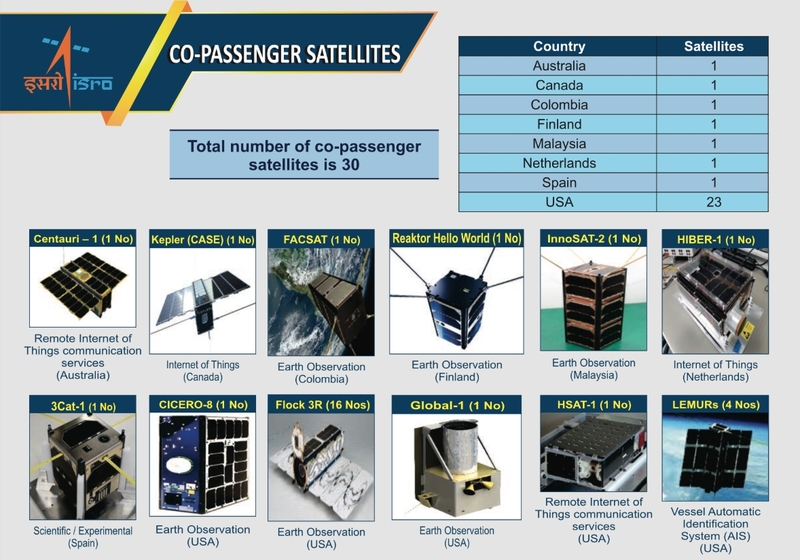 HSAT-1 will carry out a technology demonstration mission and carries Earth imaging and AIS receiver payloads. The satellite’s imaging system has a resolution of up to 698 meters (2,290 feet), while AIS signals will be collected through two deployable antennae: a monopole antenna will be used for the first two months of the mission, before a broad-bandwidth deployable antenna (BBDA) is deployed and used for the remainder of the satellite’s lifespan. HSAT-1 will use Globalstar satellites for its primary method of communication with the ground, with an S-band radio carried as a backup. The satellite is expected to operate for two years. Hiber Global of the Netherlands will operate the Hiber 1 satellite, another 6U payload which will serve as a demonstration mission for a future planned low Earth orbit communications network. Hiber plans to launch up to fifty satellites to provide worldwide connections for internet of things (IoT) devices. Like Hiber 1, CASE – which is being carried for Canada’s Kepler Communications – will also serve as a pathfinder for a constellation of communications satellites to link IoT devices. Named after a robot in the film Interstellar, CASE follows on from the KIPP satellite that was deployed by a Chinese Chang Zheng 11 rocket in January. It is a three-unit CubeSat that was built by Glasgow-based Clyde Space. A third prototype IoT communications satellite is Centauri 1 a 3U CubeSat, which will be operated by Australia’s Fleet Space Technologies. FACSAT-1, another three-unit CubeSat, will be the first satellite to be operated by the Colombian Air Force, the Fuerza Aérea Colombiana (FAC). Built by Sweden’s GOMSpace, FACSAT-1 is primarily a demonstration mission, although it carries an imaging payload that will be used for agriculture and land use monitoring, disaster response and urban planning in Colombia. The satellite can image the Earth at resolutions of up to 30 meters (98 feet). Malaysia’s Innovative Satellite 2, or InnoSAT-2, is a three-unit CubeSat that will perform a series of technology development experiments for Astronautic Technology (M) Sdn. Bhd. (ATSB). Reaktor Hello World is a two-unit CubeSat built by Finland’s Reaktor Space Lab. The satellite will demonstrate a two-unit CubeSat platform named Hello World and also carries an amateur radio beacon and a hyperspectral imaging payload. Spain’s 3Cat-1 is a single-unit (1U) satellite being flown for the Polytechnic University of Catalonia to test a suite of instruments and equipment in space. It will test CellSat solar cells designed for future missions, a micro-electro-mechanical sensor to detect atomic oxygen, a graphene field-effect transistor (GFET), a wireless power transfer system and an autonomous beacon transmitter powered by a Peltier cell – independent of the rest of the satellite’s systems – that will continually broadcast the satellite’s temperature. For calibration, 3Cat-1 is also equipped with a Geiger counter and a low-resolution camera. A Polar Satellite Launch Vehicle (PSLV) placed HySIS and its fellow passengers into orbit. 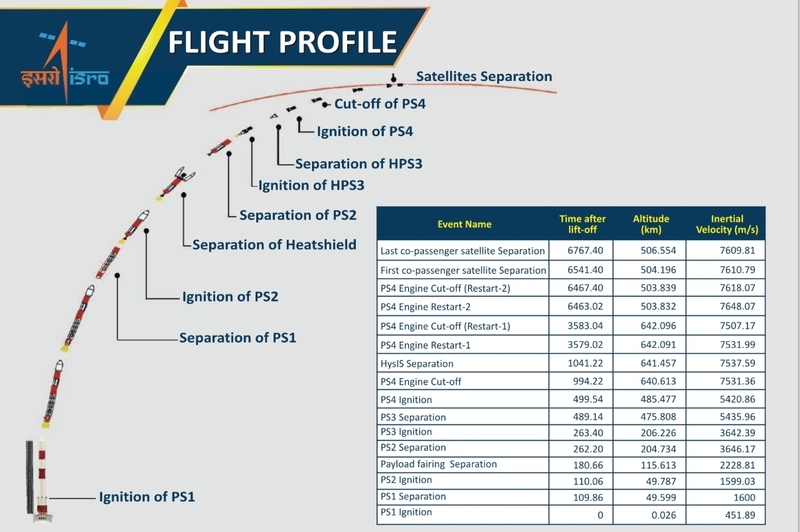 The four-stage PSLV flew in its Core Alone (PSLV-CA) configuration, which is used for lighter payloads which do not require the additional thrust of any strap-on boosters at liftoff. PSLV-CA is one of three versions of the PSLV that can be used – the original version of the rocket, PSLV-G, features six additional solid rocket motors clustered around the first stage, while the PSLV-XL uses larger boosters to carry even heavier payloads. Thursday’s launch was designated PSLV C43, and will be the forty-fifth flight of the PSLV across all configurations, and the thirteenth use of a PSLV-CA. PSLV launches are conducted by the ISRO, with rideshare payloads contracted through its commercial arm, Antrix Corporation. The PSLV flew from the Satish Dhawan Space Centre on Sriharikota island, which has hosted all of India’s orbital launches. PSLV C43 lifted off from the First Launch Pad (FLP), a complex that was constructed in the early 1990s ahead of PSLV’s maiden flight in 1993. When launched from FLP, rockets are currently integrated vertically at the launch pad using a mobile service tower, however the launch complex is expected to undergo a refit in the near future to allow rockets to be assembled away from the pad. Thursday’s launch began with ignition of PSLV’s first stage, PS1, when the countdown reaches zero. Under the power of its S-138 solid rocket motor, PSLV climbed away from Sriharikota on a south-easterly azimuth of 140 degrees. The first stage burned for the first 110 seconds of flight before burning out and separating. Two tenths of a second later, the rocket’s second stage, PS2, ignited. The PS2, also known as L-40, is liquid-fuelled. It burns UH25, a mixture of three parts unsymmetrical dimethylhydrazine and one part hydrazine hydrate, which is oxidized by dinitrogen tetroxide. The second stage is powered by a Vikas-4B engine, a license-built version of the French Viking. Second stage flight lasted 142 seconds from ignition until shutdown and separation. About seventy seconds into the second-stage burn PSLV’s payload fairing – termed a “heat shield” by ISRO, was jettisoned. PSLV’s third stage ignited 1.2 seconds after second stage separation, burning its S-7 solid motor for about seventy seconds. The third stage is designated HPS3, denoting an upgraded version of the original PS3 stage that has been used since PSLV’s seventh launch in 2002, although in practice the PS3 and HPS3 designations are often used interchangeably. After completing its burn, the HPS3 remained attached to the fourth stage for a brief coast period as the rocket climbed towards the apogee, or highest point of its trajectory. About 166 seconds after burnout, the third stage separated. The fourth and final stage of PSLV is the liquid-fuelled PS4, or L-2.5. This has two restartable engines burning monomethylhydrazine and mixed oxides of nitrogen. During Thursday’s launch the PS4 made three burns, the first of which began ten and a half seconds after third stage separation – or just before 500 seconds mission elapsed time. This burn lasted eight minutes and 15 seconds, placing the fourth stage and its payloads into a circular sun-synchronous orbit at an altitude of 636.6 kilometers (395.6 miles, 343.7 nautical miles) and an inclination of 97.957 degrees. Forty-seven seconds after the fourth stage ends its burn, HySIS separated from PSLV to begin its mission. With its primary payload deployed, PSLV will turn its attention to deploying the remaining satellites. These will still be placed into a sun-synchronous orbit, however this will be lower – at 504.5 kilometers (313.5 miles, 272.4 nautical miles) – and inclined at 97.468 degrees. The first of two further PS4 burns to reach this orbit will begin 42 minutes and 18 seconds after HySIS separates, and will last for four seconds. Forty-eight minutes later, a four-and-a-half second firing will re-circularise the orbit at the lower altitude. Spacecraft will begin separating 74 seconds after cutoff, with the first and last separation events occurring three minutes and 46 seconds apart. PSLV C43 is currently scheduled as ISRO’s penultimate launch of 2018, with a GSLV Mk.II slated to deploy the GSAT-7A satellite in mid-December. 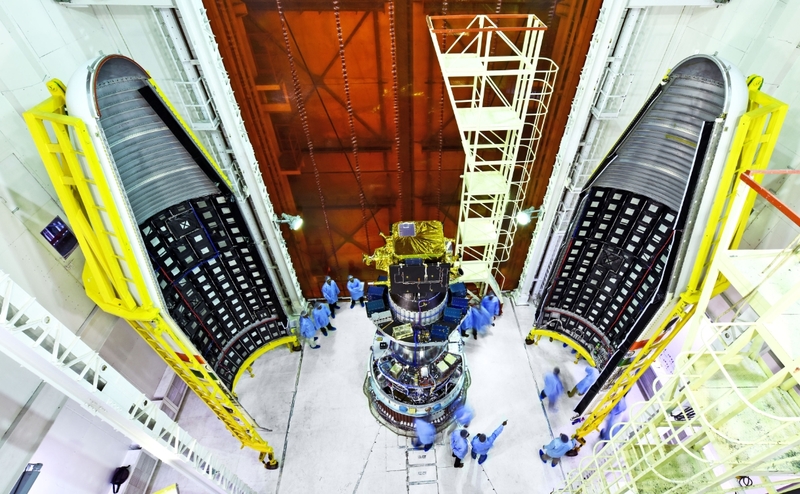 Before then, ISRO’s GSAT-11 satellite will be carried aloft by a European Ariane 5 rocket. Four of the companies with secondary payloads aboard Thursday’s launch: Planet Labs, BlackSky Global, Hiber Global and Fleet Space Technologies, are expecting to have further spacecraft placed into orbit in the next week when SpaceX conducts the SSO-A rideshare mission using a Falcon 9 rocket. This launch is currently scheduled to occur no earlier than 2 December.